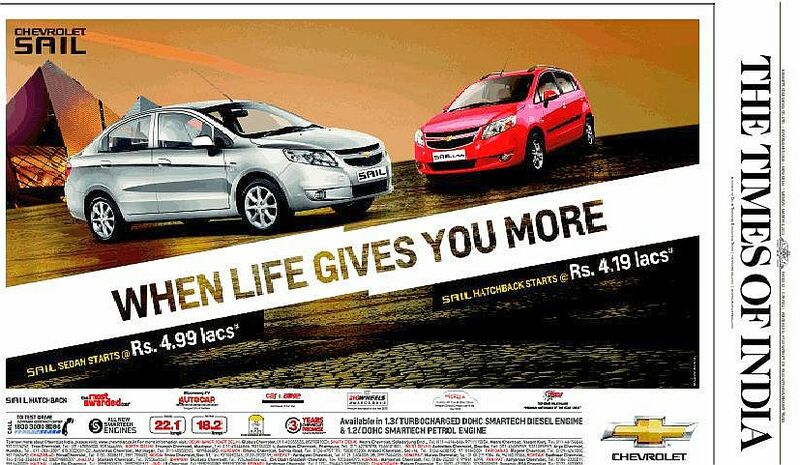 General Motors have seemed to be dropped prices of its Sail hatchback as per the newspaper advertisement. The new advertisement showed price of Rs 4.19 Lac, as compared to previous price of Rs 4.49 Lac. There seems to be drop of Rs 30,000 apprx. The official announcement from the company is pending. The car maker has managed to sell just 4,000 units of hatchback since the time of its launch since November 2013. The car maker also launched the Sail sedan later with a marginal - Rs 50,000 price difference between hatchback and Sedan, thereby a reduction in prices of hatchback was imminent. Developed by General Motors’ Chinese partner SAIC, the Sail twins are spacious cars that offer a value price tag. The cars based on the Sail platform have been resounding successes in the Chinese car market. GM India will be hoping that some of this success will rub off on the Indian variants as well.